A giant, four-story igloo-shaped hotel in the shadow of Denali. It seems like a brilliant idea. Who wouldn’t want to spend the night in an architecturally unique home-away-from-home, then get up and explore the wilds of Alaska? What could possibly go wrong? It turns out, just about everything. As you drive up the Parks Highway, you’ll be mind-numbed by about 200 miles of pavement, and at least 175 miles of trees. And then suddenly, there’s a reason to pull off the road and take a picture. Out here in the middle of nowhere, somebody decided to build an igloo, but not out of ice. Even in Alaska, ice would have melted by now. This thing isn’t going anywhere. 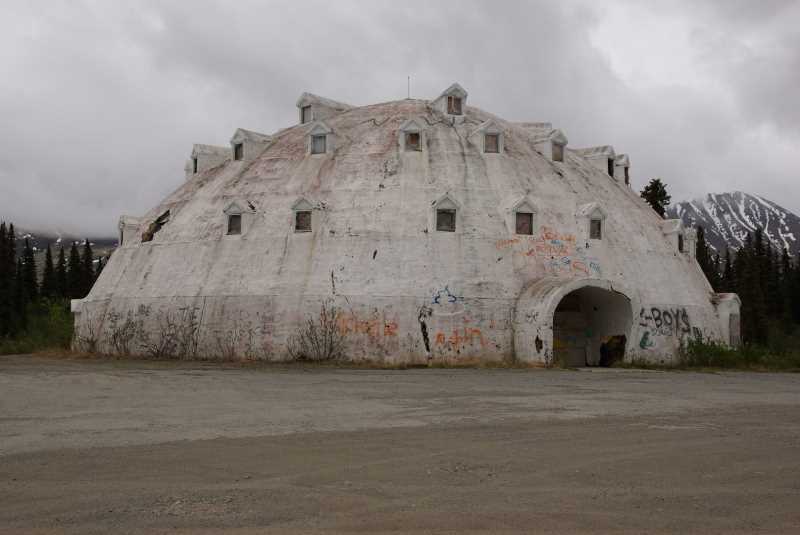 Igloo City was built in the 1970’s, mostly by one man, the original owner, Leon Smith. The idea was to use the first floor of the igloo as a restaurant and gift shop, and the upper floors as motel rooms. The outer shell was built, and a skeleton was framed up inside, but the work was never completed. The building — specifically the tiny windows — didn’t meet the building codes. Add to it, because of the remote location, there’s no electricity, so generators would be needed to power the place, at great expense. The original owner tried to sell the property three times, and each time, the buyers didn’t pay, and he repossessed it. Finally, desperate to sell, he accepted a low-ball offer from Brad Fisher of Fisher’s Fuel. Brad operated the gas station for a while, and hoped to complete the dream of an igloo hotel, but the numbers never added up. High fuel prices eventually made it too expensive even to run the generator for the gas station, and it shut down. Around 2013, the igloo made the news, when Brad put it up for sale. 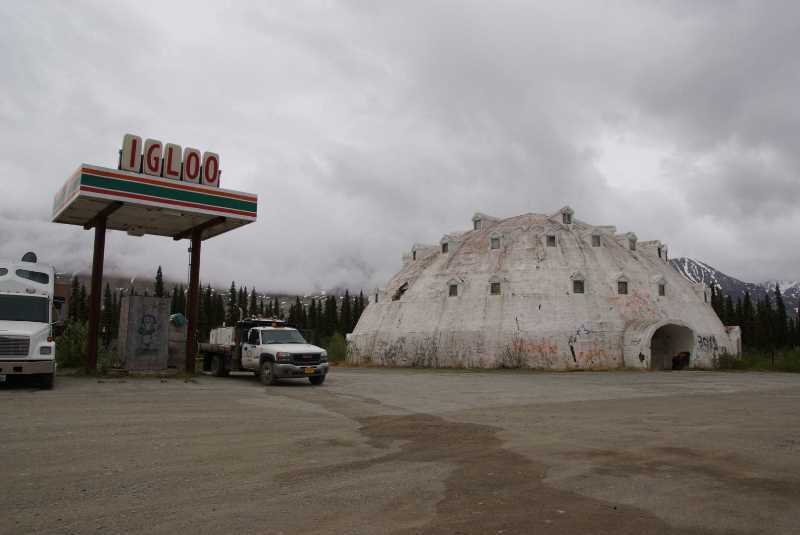 The price tag: a mere $300,000, for the igloo, the gas station, and 38 acres of land. What a bargain! Yeah, except by one estimate, it would cost $1.3 million to bring the igloo up to code, finish construction, repair the ravages of vandals and weather, build a power station, get water running, and open up the business. Maybe it will happen someday. Until then, the igloo is a sketchy place. It’s safe enough to stop for a moment and take pictures, but when I visited, there were numerous trucks, RV’s, and big-rigs parked around the old, boarded-up gas pumps. Maybe people were camping there? Living there? I’m pretty certain the business wasn’t open. The igloo’s door and windows were boarded up. I would have loved to peek inside and briefly dream of moving to Alaska and operating an igloo hotel. I don’t know if the igloo ever sold, or if the price has dropped. Most of the information I used to write this page came from an Alaska Dispatch News article from 2013. You can also check out some photos on Flickr, which show the interior of the igloo. Thankfully, by the time you get to the Igloo, the most boring part of the Parks Highway is behind you. 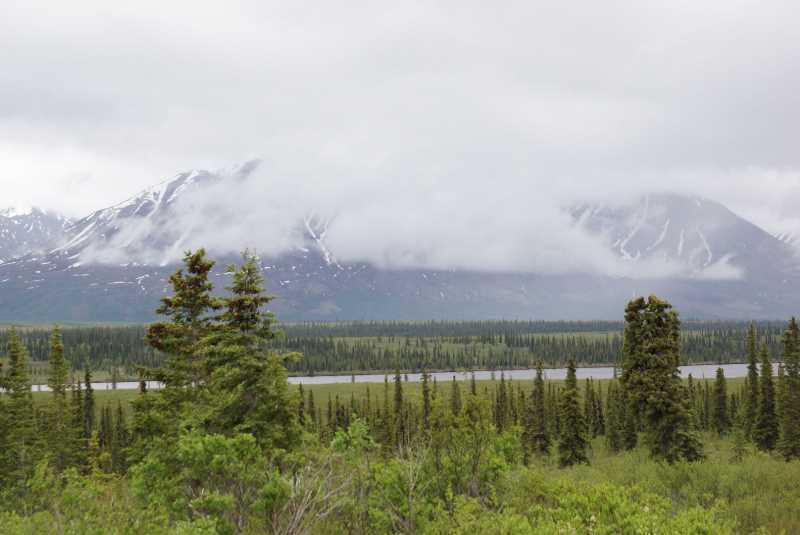 At this point, you’re really getting up into the arctic, which means the trees are getting smaller, and you can see more of the wide-open landscape. I stopped in the area of Summit Lake to take in the panorama of mountains. It’s not easy to see, but Summit Lake is out there, in between the highway and the mountains to the southeast. 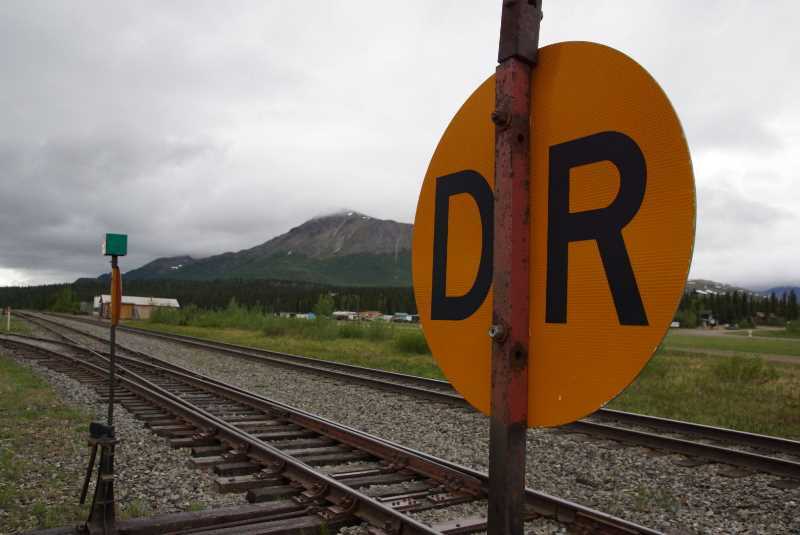 About 22 miles north of Igloo City, you reach an actual town — or at least what passes for a town in Alaska. 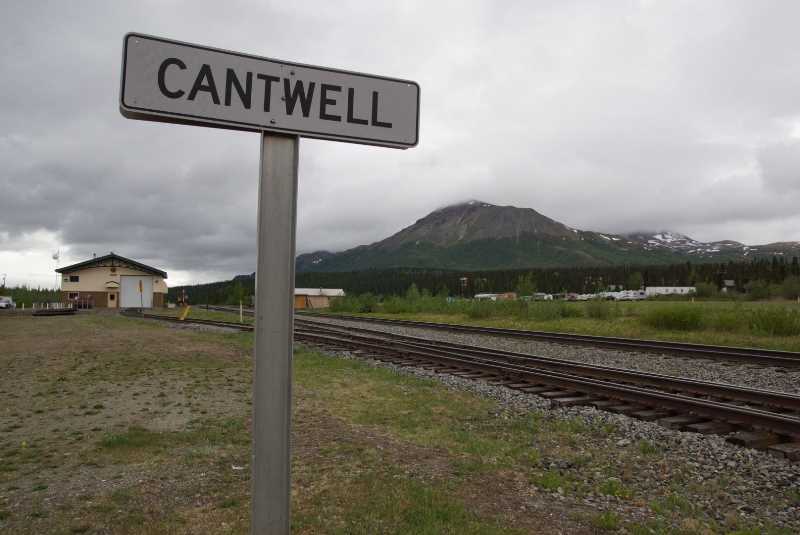 Cantwell is located off of the Parks Highway, out at the western end of the Denali Highway. 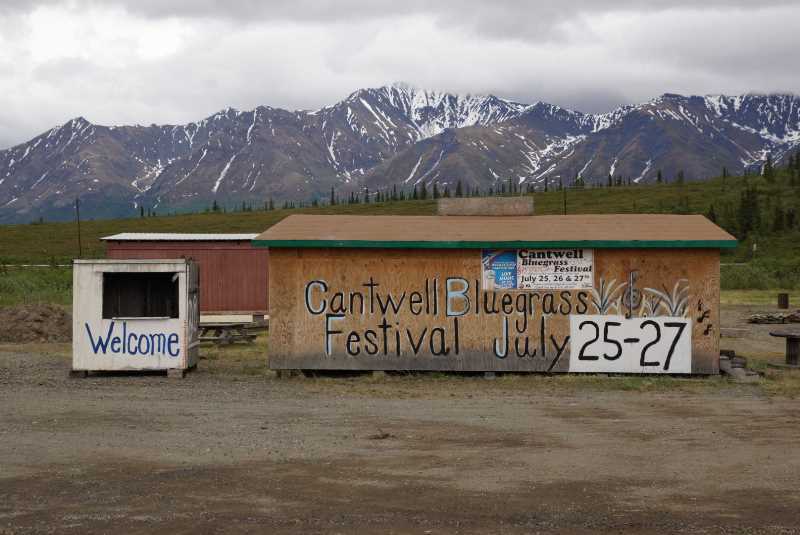 The lodge hosts the Cantwell Bluegrass Festival in late-July. Although my visit was in May, 2015, the numbers on this building seem to advertise the festival in 2014. I don’t know if it’s happened since then. Leaving Cantwell, the rain that had plagued me ever since Seward was finally taking a break, and the clouds had lifted slightly, revealing some of the nearby mountains. 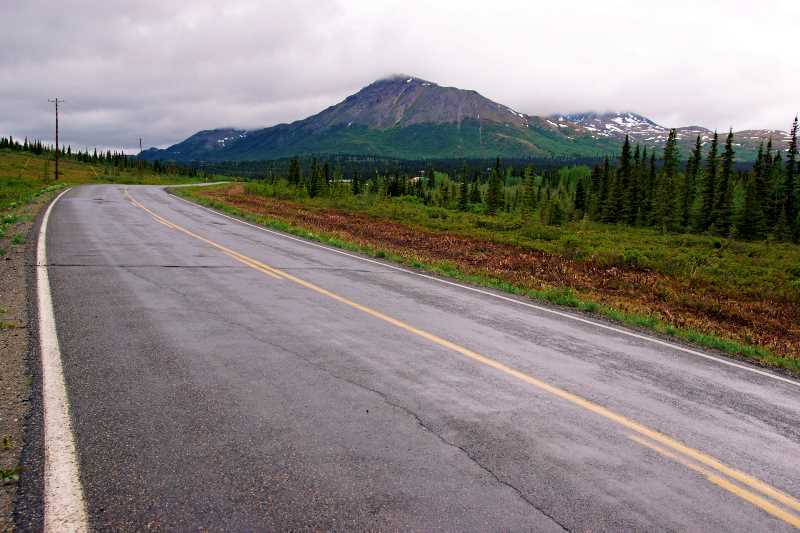 This stretch of highway is the end of the Denali Highway, which is mostly unpaved, and cuts east-west across the center of the state. 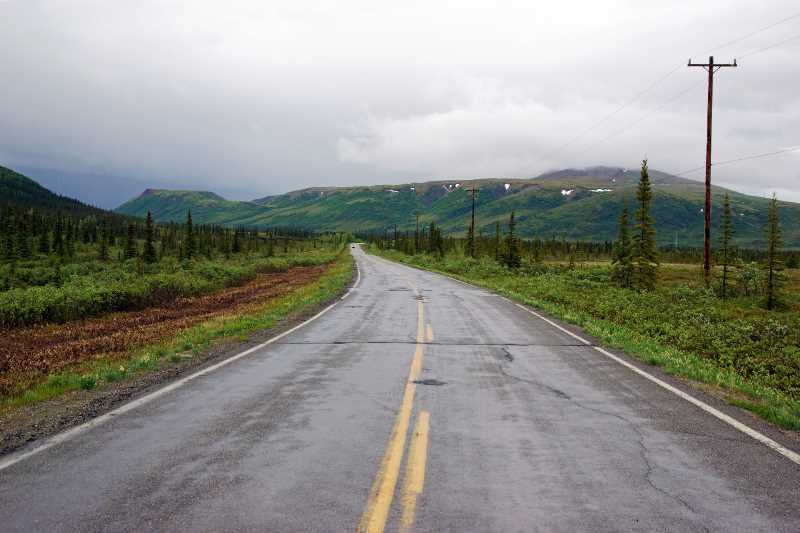 I encountered the Denali Highway again near Paxson, and drove the eastern end of the Denali Highway, later in the trip. 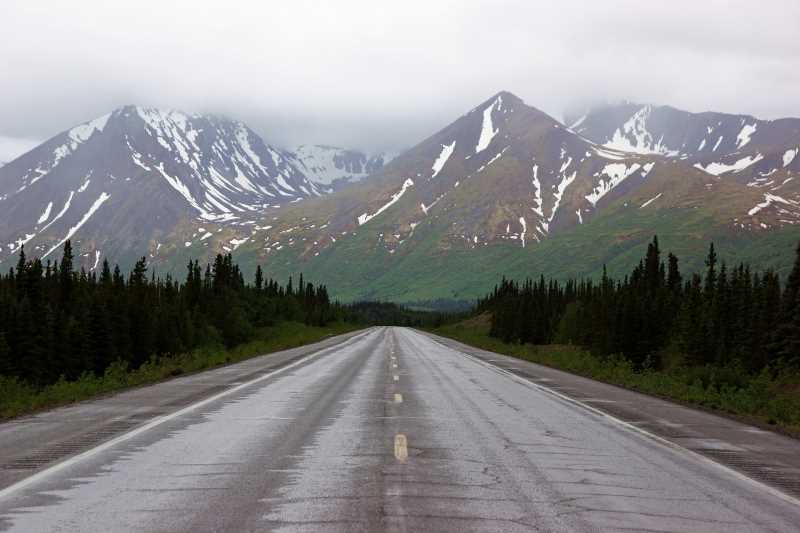 Back on the Parks Highway, a beautiful drive awaited, all the way to the Denali National Park area. It’s about 30 miles from Cantwell to the entrance to the park. That makes Cantwell’s handful of lodges and B&B’s a reasonable alternative to the pricier hotels near the park entrance. 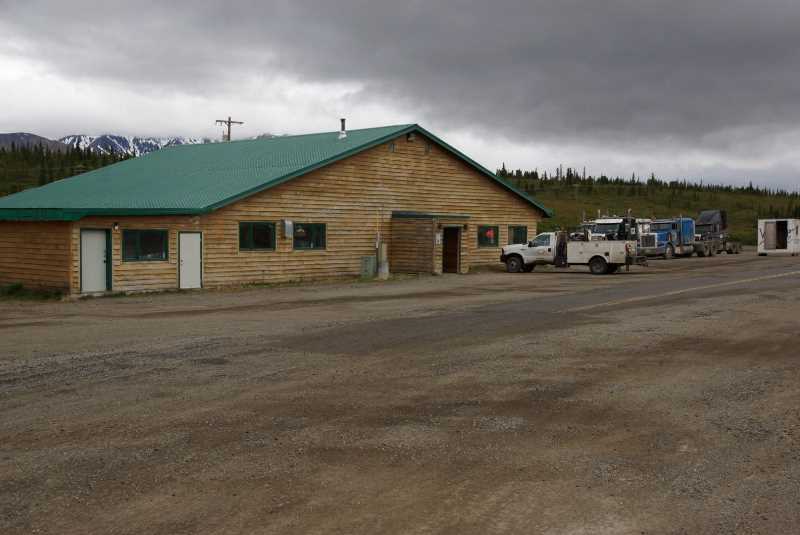 However, I found a fairly inexpensive place to stay in Healy, Alaska, about 10 miles north of the park entrance.